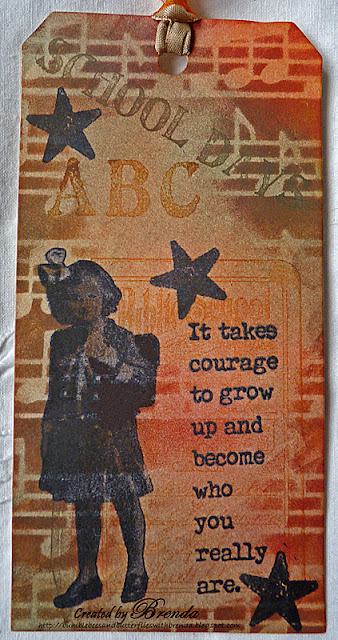 With the theme at PanPastels UK this week, I wanted to use a new stamp set called 'School Days' from Oxford Impressions and the embossed ink layering technique worked perfectly for this. I lost count of how many stamped and masked layers of the Panpastel colours there are, but I love the finished product. In fact I made four of these tags and each one is different. No embellishments, just fabulous PanPastels used with embossing ink and stamping. Enjoy and thanks for taking the time to visit me. I am having a rare little jolly in blogland this morning ... I have enjoyed checking out your fabby creations that I have missed, such a gorgeous variety ..... Love the gorgeous vintage baby cards, and the fabby little boxes. Love this tag, great colours and I love the techniques you have used. An absolute stunner Brenda. The stamped background looks amazing and the colours are just gorgeous. I've just been admiring Claire's gorgeous purple creation too and I definitely need more Pan Pastels! Beautiful tag Brenda. Love the background. Great. Fantastic tag Brenda. You have inspired me to get out my PanPastels and have a go with this technique. It is great to see this little girl. New stamps are always fun to play with and there is no doubt you had fun with this set. We cannot get Pan Pastels here in NZ as yet, so I am always intrigued to see the effect they have on Paper and the stamps. I am loving what I view before me, and if I had some at this moment I would be inspired to show you a creation Ha....another day......I am waiting patiently for my distress markers to arrive, maybe this week! Beautiful sentiment on this card too. Wonderful tag, love the background and the gorgeous colours. great tag Brenda. "School days" how appropriate! I am now stocking boxes and books for altering ... will be getting more stuff....you mind find them interesting. Hope you have had a good weekend. Will you be going to the NEC show? Oh what a fab tag Brenda. Great tag Brenda. It has a lovely nostalgic feel to it and I love the quote.